… and one of the most non-negotiable. You’ve gotta eat. But if you’re a regular TPH reader, you probably also know there are myriad ways to save big on groceries, so long as you take the time to plan and strategize your shopping trips. 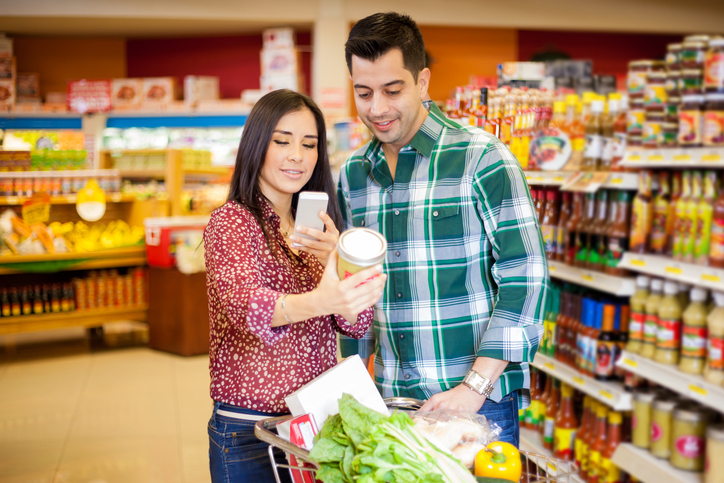 But no matter how many coupons you clip or rebates you scan into Ibotta, you’re overpaying for your groceries if you don’t shop at the right store. But luckily, there’s a way around that cost, too. It just takes a little investigative footwork. Since prices can vary wildly between retailers, you can save a lot by switching to the store that charges least for your staples. That’s what I discovered when I did my own grocery comparison a few months ago. I recorded prices for twelve common items at Publix, Trader Joe’s and Walmart. For the purposes of the post, I tried to stick to common household staples you may have in your own kitchen. 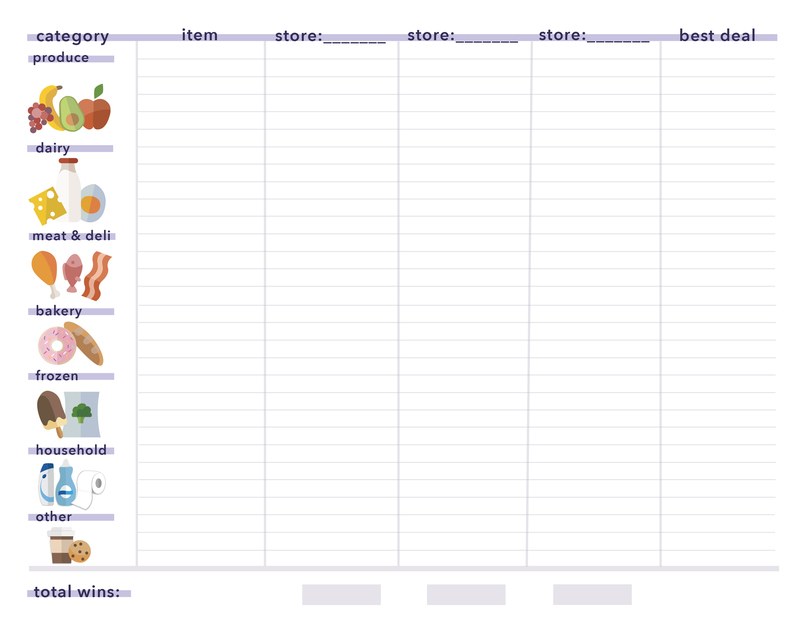 But since everyone’s list is different, we created a supermarket comparison template for you to print out and complete yourself. This way, you’ll automatically get the most bang for your grocery budget buck — no matter what’s on your list. Click for a larger version you can print out. Comparing grocery stores is going to take some time and effort up front. You’ll need to travel to several stores in your area, locate your staples, record their prices and compare costs. But while doing your supermarket comparison may seem like a chore, it can actually be a lot of fun. You’ll feel a little bit like a private investigator. And once you’re done, you’ll save money every time you shop — no further thought or effort required. It’s super simple! Here’s what to do. First things first: Make a list of your most commonly purchased items — those things you absolutely always have in the house. You still want the best price on your one-off treats or occasional buys, of course. But if the cookies or candy you buy every once in a while are a lot cheaper at a certain store — and all your staples are more expensive — you might not see the true winner. So to best automate your savings, stick with the stuff you always have on hand. We’ve created some suggested categories in our sheet to help get you thinking, but if you don’t eat meat, for instance, no worries — just use those spaces for more veggies, or whatever else you buy! If you purchase some of your items in bulk, like toilet paper, don’t include them — you’re almost definitely getting a better deal at your warehouse club store. But if you wanted to do a comparison to figure out which club to join, guess what? This worksheet will work for that, too! Now that you’ve got your list, it’s time to choose which stores you want to compare. Pro tip: Pick stores close enough to your home or workplace that you can see yourself actually traveling to them on a regular basis. If some shop 50 miles away has awesome deals, great — but you’ll be cutting into some of your savings by driving so far, to say nothing of the opportunity cost of spending so much time on a weekly necessity. Plus, when it comes down to a busy Tuesday night when you need to swing by the store because you’re out of milk or toilet paper or insert-essential-here, you’re not going to want to drag yourself all the way across town. Do yourself a favor and only survey stores within a reasonable distance. Fill in their names along the top of the list — and get ready to figure out which one you’ll start seeing a lot more of! Here comes the time-intensive part. You have to find time to head to each of your chosen stores, track down those items and write down their prices. You don’t have to do it all at once, so take your time. Fit it in by doing your normal weekly grocery shopping at each store as needed — just remember to actually write down the prices when you go! An important note: Remember to write down the amounts of the items, as well. In some cases, stores won’t carry the same item in the same size. Even if the total sticker price is cheaper, you’re not getting a better deal if you’re getting less product! By recording the actual amount of each item, you’ll be able to calculate the cost per unit or ounce, so you’ll know exactly how it’s priced. Once you have all the prices and amounts listed for each of your stores, start comparing those prices and figuring out which store has the best deal. If it’s a one-for-one comparison (say $3.49 versus $3.09 for a pound of boneless, skinless chicken breast), it’s easy: Just record whichever store has it cheaper in the column on the right hand side. But in some cases, you’ll have to do some math if two stores don’t package the item in the same amounts. For example, check out my sample math to figure out which deal for bacon is best. Since Publix had 16-ounce packages marked at 2-for-$8, it technically won at 25 cents per ounce. But if that sale wasn’t going on, Walmart would be the winner — so it’s not always an easy race to judge. Which brings me to another caveat: Quality matters! Feel free to factor in cases where you’d rather spend a little bit more per ounce for a product you like better, or for fair trade, organic or humanely raised food items. For example, the coffee at Trader Joe’s is more expensive, but in my comparison, I decided it won over dirt-cheap Walmart. I’d rather drink TJ’s delicious dark roast than Maxwell House, even if it costs a bit more. And although in my comparison Walmart and Publix ended up tied, I’d probably still rather frequent Publix — even if I pay more for some items because I feel better about how the store treats its employees. 5. Name a Victor — and Start Shopping Smarter! Now look at the right-hand column and count how many times each store’s name appears. Record the total number in the bottom of the store’s column (see my example above). Whichever store’s name appears the most is where you should shop to save the most money on the bulk of your grocery purchases. Congrats, you’ve just automated your grocery savings! You can rest assured you’re saving money every time you shop, even if you never clip another coupon. Of course, markets and prices change, so you’ll want to revisit your comparison fairly regularly. And besides — just try to tell me you didn’t have fun sneaking around the stores, recording their prices. And if you really didn’t? I bet your kids would. So next time, recruit some help. Your Turn: Which grocery store is cheapest for YOU? Show us your completed comparison worksheets!